Visitors to the Twitch homepage are greeted with autoplaying videos of active live streams. These streams have two simultaneously playing videos: one of the streamer’s face as he or she plays, and a second, larger video of the game interface. The streamers commentate as they play, either with others who are co-playing, or with viewers of the stream who can communicate directly with the streamer(s) via chat. “Twitch.” Crunchbase, www.crunchbase.com/organization/twitch. Accessed 18 Sept. 2018. “Twitch.Tv – About.” Twitch.Tv, www.twitch.tv/p/about/. Accessed 18 Sept. 2018. Johnson, Mark R., and Jamie Woodcock. “‘It’s like the Gold Rush’: The Lives and Careers of Professional Video Game Streamers on Twitch.Tv.” Information, Communication & Society, Oct. 2017, pp. 3. Crossref, doi:10.1080/1369118X.2017.1386229. “Audience | Twitch Advertising.” www.twitchadvertising.tv/audience/. Accessed 18 Sept. 2018. “Twitch Statistics and Charts.” TwitchTracker, www.twitchtracker.com/statistics. Accessed 18 Sept. 2018. “Ninja.” Twitch, https://www.twitch.tv/ninja. Accessed 18 Sept. 2018. Hicks, Antonio. “Streamlabs Livestreaming Q4 Report: Tipping Reaches $100M for the Year; YouTube Dominates In….” Streamlabs Blog, 25 Jan. 2018, www.blog.streamlabs.com/streamlabs-livestreaming-q4-report-tipping-reaches-100m-for-the-year-youtube-dominates-in-4bf450fae536. Hamilton, William A., et al. “Streaming on Twitch: Fostering Participatory Communities of Play within Live Mixed Media.” Proceedings of the 32nd Annual ACM Conference on Human Factors in Computing Systems – CHI ’14, ACM Press, 2014, pp. 1315. Crossref, doi:10.1145/2556288.2557048. Hamilton, William A., et al. “Streaming on Twitch: Fostering Participatory Communities of Play within Live Mixed Media.” Proceedings of the 32nd Annual ACM Conference on Human Factors in Computing Systems – CHI ’14, ACM Press, 2014, pp. 1316. Crossref, doi:10.1145/2556288.2557048. Johnson, Mark R., and Jamie Woodcock. “‘It’s like the Gold Rush’: The Lives and Careers of Professional Video Game Streamers on Twitch.Tv.” Information, Communication & Society, Oct. 2017, pp. 2. Crossref, doi:10.1080/1369118X.2017.1386229. Gray, Alex. “The Explosive Growth of ESports.” World Economic Forum, 3 July 2018, www.weforum.org/agenda/2018/07/the-explosive-growth-of-esports/. Putz, Andrew, and Anthony Mirhaydari. “Amazon, Twitch and the Rise of Game Streaming.” PitchBook, 10 May 2018, www.pitchbook.com/news/articles/amazon-twitch-and-the-rise-of-game-streaming. Taylor, Nicholas Thiel. “Now You’re Playing with Audience Power: The Work of Watching Games.” Critical Studies in Media Communication, vol. 33, no. 4, Aug. 2016, pp. 295. Crossref, doi:10.1080/15295036.2016.1215481. Clark, Taylor. “How to Get Rich Playing Video Games Online.” The New Yorker, Nov. 2017. www.newyorker.com, www.newyorker.com/magazine/2017/11/20/how-to-get-rich-playing-video-games-online. Perez, Sarah. “Twitch Opens Up Its Money-Making Tools to Tens of Thousands of Non-Partnered Channels.” TechCrunch, 21 Apr. 2017, www.techcrunch.com/2017/04/21/twitch-opens-up-its-money-making-tools-to-tens-of-thousands-of-non-partnered-channels/. Herrman, John. “With Twitch, Amazon Tightens Grip on Live Streams of Video Games.” The New York Times, 18 June 2018. NYTimes.com, www.nytimes.com/2018/06/17/business/media/amazon-twitch-video-games.html. Stephenson, Brad. 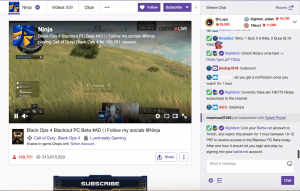 “Everything You Need to Know About Twitch Subscriptions.” Lifewire, 27 Aug. 2018, https://www.lifewire.com/twitch-subscriptions-4147319. Lastowka, Greg. “User-Generated Content and Virtual Worlds.” Vanderbilt Journal of Entertainment and Technology Law, vol. 10, no. 4, Summer 2008, pp. 900. Postigo, Hector. “The Socio-Technical Architecture of Digital Labor: Converting Play into YouTube Money.” New Media & Society, vol. 18, no. 2, Feb. 2016, pp. 335. Crossref, doi:10.1177/1461444814541527. Postigo, Hector. “The Socio-Technical Architecture of Digital Labor: Converting Play into YouTube Money.” New Media & Society, vol. 18, no. 2, Feb. 2016, pp. 344. Crossref, doi:10.1177/1461444814541527. Perez, Sarah. “Twitch Solidifies Its Lead with Viewership up 21% in Q1, While YouTube Gaming Drops.” TechCrunch, 26 Apr. 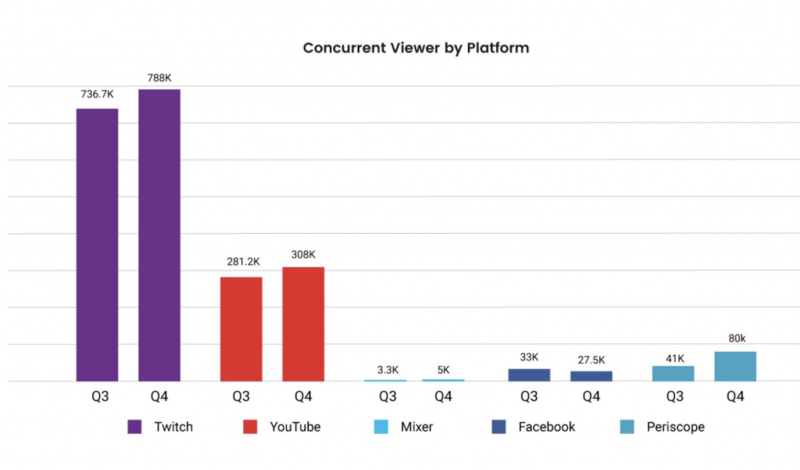 2018, http://social.techcrunch.com/2018/04/26/twitch-solidifies-its-lead-with-viewership-up-21-in-q1-while-youtube-gaming-drops/.